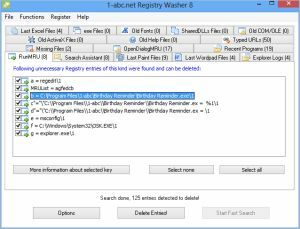 1-abc.net Registry Washer - Speed up your system by cleaning up your Windows Registry! The Windows Registry is a place where all programs add important configuration data to. When you start your computer, Windows always checks its Registry to let all installed software know local settings, paths of the programs, last opened documents, specific user options and much more. Unfortunately, not every software program removes each entry it made to this registration database when it’s not necessary anymore. Additionally, Windows itself saves data to the Registry that you probably never ask for again. As long as this concerns only a few entries, it does not matter. The problems occur, the longer your Windows is installed and the more programs you installed and un-installed since then. Any time when a program or the system looks for Registry information, old and unnecessary entries slow down this process. 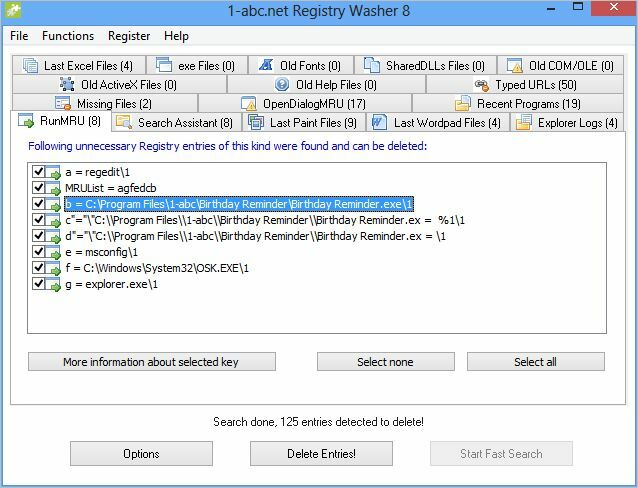 1-abc.net Registry Washer looks what can be removed from the Registry and cleans it up! And there is another reason why you should clean up your Registry from time to time: whatever you did on your PC and whatever you did to remove it: the Registry may still remember it! So 1-abc.net Registry Washer also helps you to secure your privacy by deleting all this old data. Just check it out: you will be surprised how many old sins this program finds on your machine. And do not be shocked when it will be more than some 100 or 1,000 entries!